In honor of Infrastructure Week (May 11-15, 2015), we dug into a report published by the Congressional Budget Office (CBO) in March. 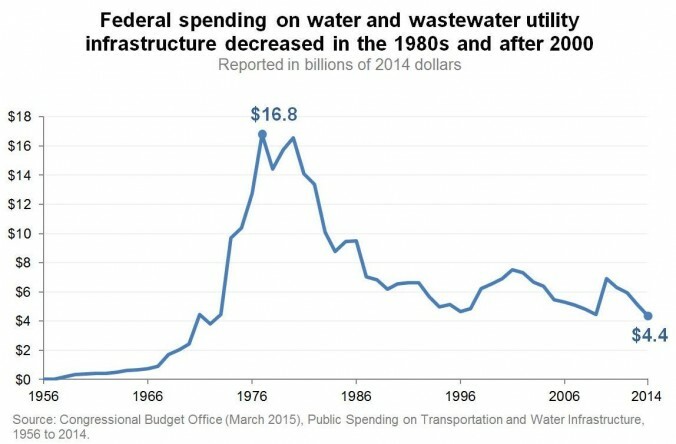 Public Spending on Transportation and Water Infrastructure, 1956 to 2014 reports on trends in federal, state, and local government spending on infrastructure, using data acquired from the Office of Management and Budget (OMB). This graph illustrates the federal funding trends for water and wastewater utilities between 1956 and 2014, in 2014 dollars. Funding levels have decreased dramatically — nearly fourfold between 1980 and 2014. The consequence for communities nationwide is even more significant when considering that a majority of the federal funds in the 1970s and 1980s were provided as grants, while the majority of the funds provided since the 1990s have primarily been loans. CBO’s report includes more detailed breakdowns on federal, state, and local spending on water and wastewater infrastructure. We published a blog post looking at four other trends in public spending on water and wastewater utilities. We also posted an Excel spreadsheet with the data here. How much does it cost to connect to a water and wastewater system?